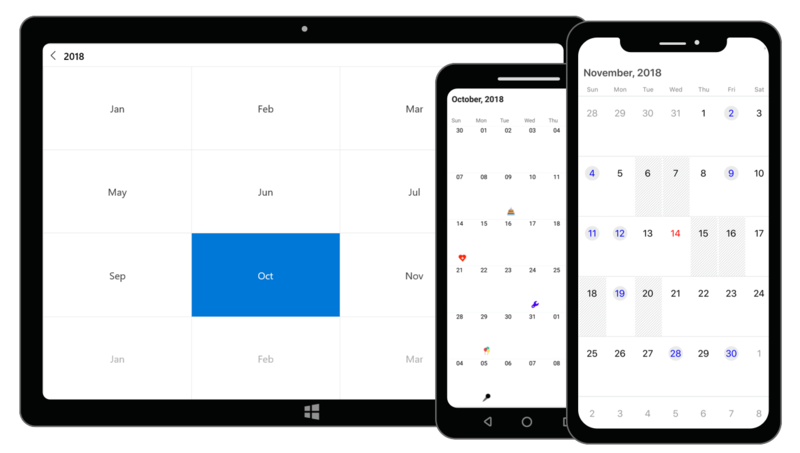 The Xamarin.Forms Calendar control (Month Calendar) lets users easily select one or more dates. It supports month and year views, blackout dates, date restriction and more. Display and navigate dates with an intuitive user interface using built-in month and year views. Month view displays dates of a month with horizontal and vertical navigations and the year view displays months of a year with vertical navigation. This also supports programmatic navigation. Select a single, multiple, and range of dates. This also supports programmatic selection. Date restriction - Prevent navigation beyond the specified minimum and maximum dates to restrict the users from selecting certain dates. Blackout dates - Disable interactions and selections for certain dates. This is useful when you want to block user interaction during holidays or any other special events. Provides a flexible way for highlighting special dates using custom templates. Month calendar supports addition of events for specific dates. Display indicators in month cells to denote the events. Show event details of the selected date in inline or agenda view. Globalization - Display date-time formats and headers in different cultures. Thus, it meets the needs of different regions. Localization - Localize all static text in the calendar. This is useful to meet the need of a particular language.